It’s that time again! I got Ipsy bag in the mail one day after I got my tracking code, which was generated about three days before I received it, and two days before the projected delivery day. I’m guessing their strategy is now to hold back the tracking numbers to give the illusion of speedy delivery? L-R: full size Starlet pencil in black, full size Nailtini nail polish in Millionaire, (guessing) deluxe sample bare mineral Marvelous Moxie gloss in Dare Devil, deluxe sample Chella eyebrow defining gel, bag and sample size the Balm Meet Matt(e) in Matt Batali. The bag – Pretty much the same bag as last time but in a deep chocolatey brown with a little more satiny with a shiny patent trim. It’s totally okay, but a little confusing that the bag is so similar when in the past, they’ve been so wildly different. I’m thinking that they got really good feedback on the last bag, though. So why mess with a good thing? Starlet eyeliner pencil in black – The color in this is fairly solid and makes pretty consistent marks. The label reads “Black total absence of light”, suggesting a deep, inky black. The tip even looks like it would make that level of black, but it definitely doesn’t draw that way. It’s got a slightly brownish lean to it and I just don’t feel like it’s an $11 eyeliner. I’ll pass on buying. Nailtini nail polish in Millionaire – This is a glitter polish. The base is a super-fine pinky gold glitter, followed by small sticks of gold, followed by long sticks of blue green. I don’t care for polishes with stick glitter because it always seems to hang off the nail. One coat of this goes on pretty sparse, two coats seems to fill out a bit better. It appears to apply very clumpy, but evens out as it settles and dries. The company’s concept is that their polishes should be layered, and I’d definitely do that with this. The biggest grr? I just scraped this off with my fingernail. For $13 a bottle, that’s a real shame. If you’re apt to shell out this kind of money on nail polish, just skip this brand and head to Chanel. 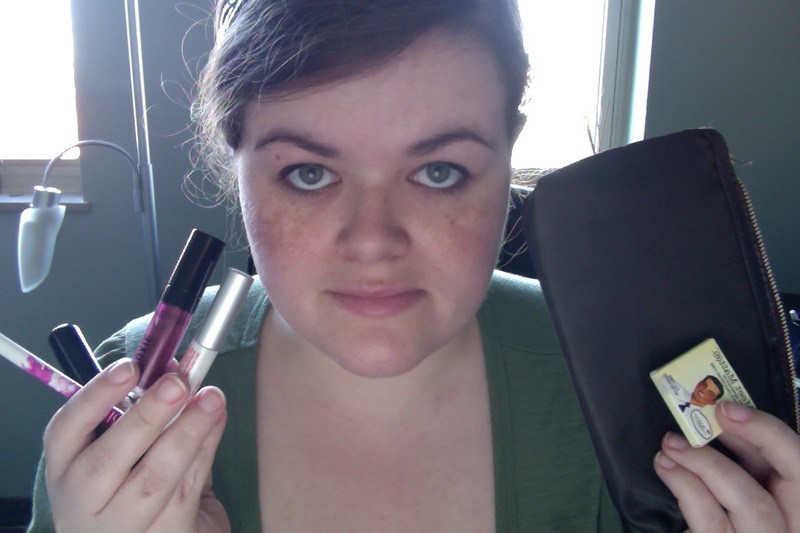 bare minerals marvelous Moxie in Dare Devil – When I saw previews of this, I was horrified. Wine-hued lips are a big mini-trend, but it’s often done far too heavy for real human use. I put this on without a mirror, just waiting for my boyfriend’s reaction. He didn’t react at all. When I checked the mirror, I was pleased to see that this went on fairly sheer and it was a generally pleasing shade for me. Whew! Unfortunately, this has a mintiness to it, which I hate. Why should lipgloss make my lips cold all day? It’s got a little stickiness and sandiness that seems to be standard for lip gloss, so it’s not a huge detractor I can’t get a handle on how big the full size of this is, but it’s $18 a tube. That’s pretty on par with similar products, so I think I could comfortably recommend this for anyone wanting to dip their toes in wine hues without going overboard. Chella eyebrow defining gel – When I saw this, I was afraid is was a pigmented product. It wasn’t, and I was deeply relieved. It’s a clear eyebrow gel with a mascara wand applicator. It also comes bearing a weird chemical smell that was sort of disconcerting. When it dried, I noticed it felt a little stiff at first. I didn’t get tremendous brow-taming results out of this. A full-size is $18. I spent far less on Covergirl clear mascara and got similar (if not better) results. The downside to Covergirl is that it doesn’t dry as quickly. The verdict? This month was a little safe, a little boring. One of Ipsy’s biggest problems is its users constantly complaining about the products they get, whether it’s the wrong colour or the size. Ipsy definitely needed a few totally unhateable bags in its corner to get their subscribers happy. And what better time than after open sign-ups? Do I hate a safe, no-way-to-hate-it bag? No way! New glitter nail polish, perfect sultry party look, more eyebrow tamer, another bag for Christmas gift dispersal. I can’t complain, and that’s the way Ipsy likes it! Bag is, as you say, fine. Not anything special. Like you, I would prefer if they take more risks. Chunky glitter nail polish? Dead to me. This one goes to my niece. My eye pencil color is chocolate and all I wear is black. I can’t remember if that was in our profile questions so I’m refraining from pouting but … also dead to me. This one goes to my sister. Moxie lip gloss – love the color, hate the applicator. This is one of the hardest doe-foot applicators I’ve ever tried. Also, is this supposed to be plumping my lips? Because the tingle is very distracting. As it happens, my lips do not require plumping so this one goes to my sister as well. Chella eyebrow gel : very intriguing. I don’t have any eyebrow gel so I’m excited to try this. However I do occasionally fill in/darken my eyebrows and I don’t know how the two will get along. Meet Matte eyeshadow : a useful staple. But I have a lot of brown eyeshadow. ( A lot. ) So we’ll see if I keep it. It may need to find a home with somebody less brown-fortunate. Ok I have to go scrub my lips now. I will be amazed if my sister keeps it. I didn’t notice that the lip gloss was supposed to be plumping, and it didn’t give me the tingle that plumpers usually give me. I don’t care much for that kind of gloss–I’ve had some plumpers that brought tears to my eyes. My usual brow filler is powder-based, kind of like a dense eyeshadow. I tried the Chella gel over that and didn’t have any trouble, though it did get a little pigment on the applicator brush. I’m sure results there will vary by product, though!